The screenshot above is hosted and provided by tipard.com. Please contact them directly for any copyright infringement as we are not responsible for that content. Last Update: 2016-09-25 - New Release: It is highly compatible with windows 10. Requirements: 1GHz Intel/AMD CPU or above, 512MB RAM or more. Limitations: 99 Trial / 15-days trial. 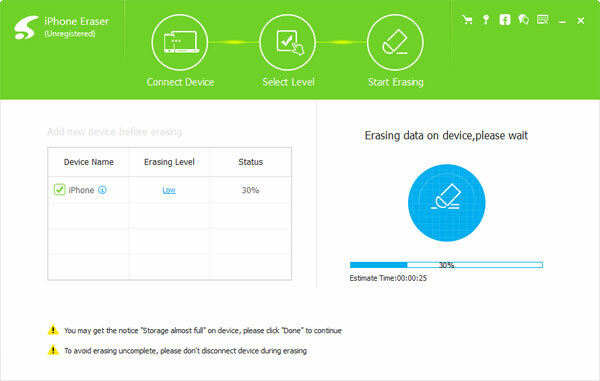 Tipard iPhone Eraser can permanently erase all contents like text messages, contacts, videos, photos and personal settings from iPhone/iPad/iPod. Moreover, it supports all iOS devices including iPhone 6s/6s Plus, iPhone 6/6 Plus, iPad pro, iPad mini 4 and iPod. It owns three erasing levels that is low level, medium level and high level. After updating, it is highly compatible with windows 10 and iOS 9. This iPhone Data Eraser can wipe all contents such as photos, music, videos, contacts, SMS text messages, Call History and more data from iPhone/iPad/iPod. Meanwhile, you can erase the personal settings in your iPhone/iPad/iPod. This iOS Data Eraser has the capability of erase deleted files in case of avoiding some special data recovery program can easily recovered deleted files from your iPhone again. In addition, the iOS Eraser can clear all junks files, Apps, history, cookies on iPhone. This iPhone Date Eraser enables you to permanently wipe all data on any iOS device, including iPhone 6s/6s Plus, iPhone 6/6 Plus, iPhone 5s/5c/5, iPhone 4s/4/3gs, iPad Air/Air 2, iPad mini 4/3/2/1, iPad 4, iPad pro, iPod touch and the latest iOS 9. Depending on your needs, this iPhone Eraser provides you three different modes to wipe your iPhone permanently. Low level will overwrite all the data on device with zero files to ensure the files can't be recovered; Medium level will overwrite all the data on devices with zero and junk files to ensure the files can't be recovered; We recommend you the high level if you have saved all data on your device.